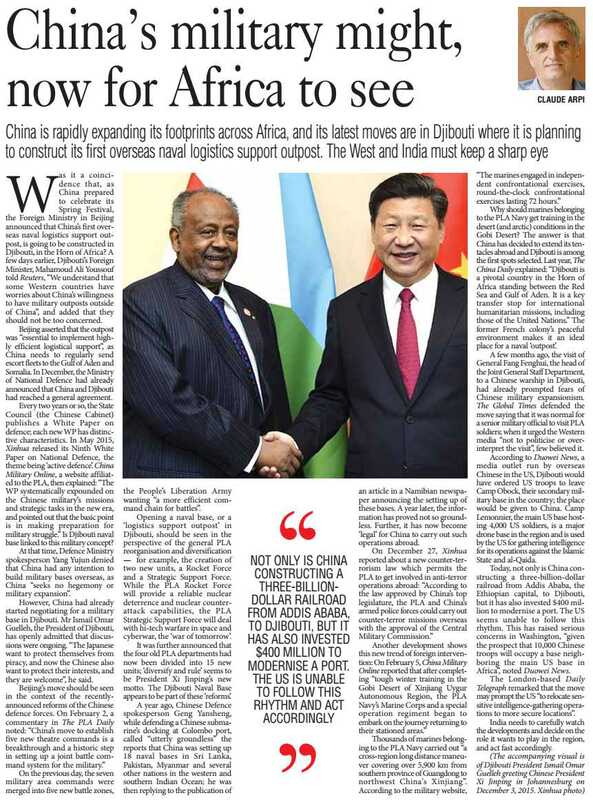 The vastness and diversity of the Indian Ocean Region (IOR) and its littorals, and difference in the latters’ overall view of regional security, presents a broad spectrum of challenges therein. The maritime capacities of most littoral states are not strong enough to individually address these challenges. However, synergised response strategies, appropriately regulated by one or two collectively mandated apex bodies, would greatly help in managing regional maritime security. The existing maritime cooperative initiatives in IOR, like the Indian Ocean Rim Association (IORA) and Indian Ocean Naval Symposium (IONS), have shown great promise and potential. Countries like India and Australia, major players in both these constructs, can possibly rally other IOR littorals into leveraging their maritime capacities under these pan-regional fora by mutual agreement. 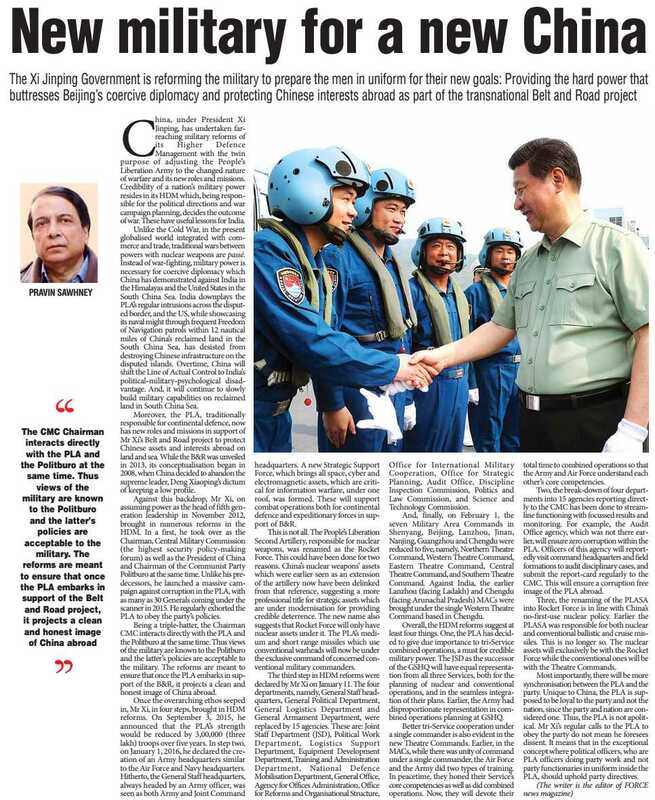 Concurrently, both initiatives could find congruence in their maritime security visions, so as to create a collaborative local environment for collective benefits without dependence on extra-regional players. The United States and India have held talks about conducting joint naval patrols that a US defence official said could include the disputed South China Sea, a move that would most likely anger Beijing, which claims most of the waterway. Washington wants its regional allies and other Asian nations to take a more united stance against China over the South China Sea, where tension has spiked in the wake of Beijing’s construction of seven man-made islands in the Spratly archipelago. 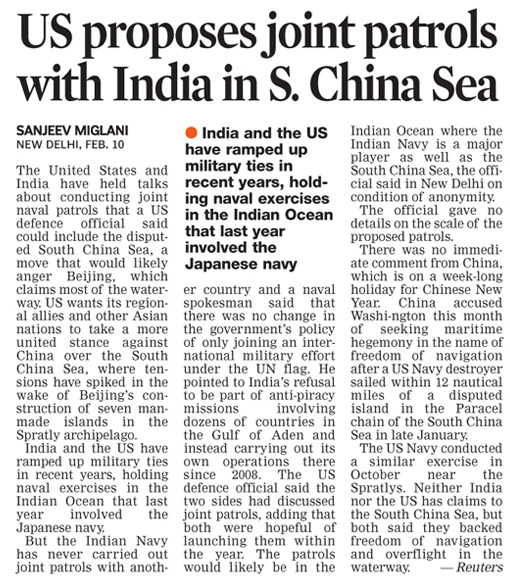 India and the US have ramped up military ties in recent years, holding naval exercises in the Indian Ocean that last year involved the Japanese navy. 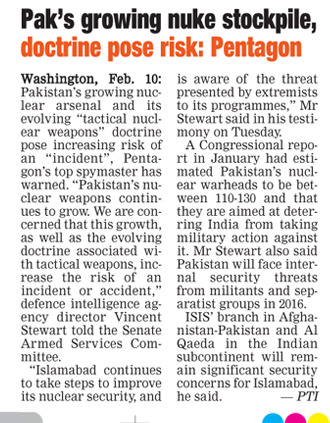 But the Indian Navy has never carried out joint patrols with another country and a naval spokesman said there was no change in the government policy of only joining an international military effort under the United Nations flag. He pointed to India’s refusal to be part of anti-piracy missions involving dozens of countries in the Gulf of Aden and instead carrying out its own operations there since 2008. 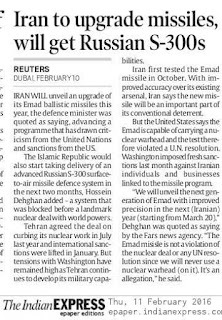 The US defence official said the two sides had discussed joint patrols, adding that both were hopeful of launching these operations within a year. 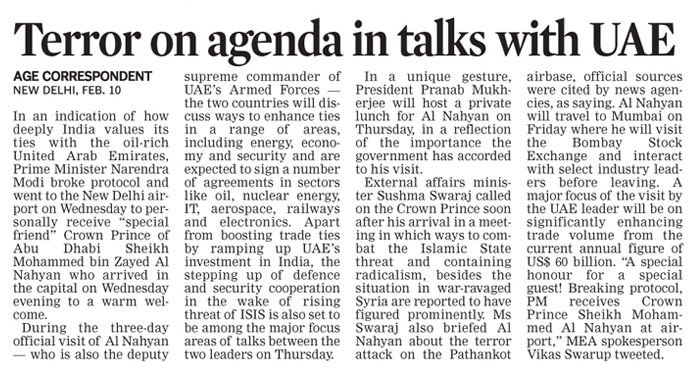 The patrols would likely be in the Indian Ocean where the Indian Navy is a major player as well as the South China Sea, the official said. The condition of Siachen survivor Lance Naik Hanumanthappa Koppad has deteriorated over the past one day and it remains “very critical”, the Army has said. Hanumanthappa of the 19 Madras Regiment was rescued alive six days after being buried under tonnes of ice following an avalanche on the Siachen Glacier on February 3. His condition was reviewed by a team of the Army Hospital (R&R) comprising critical care specialists, Head of the Dept of Medicine, nephrologists, neurologists and a panel of experts from AIIMS, New Delhi. 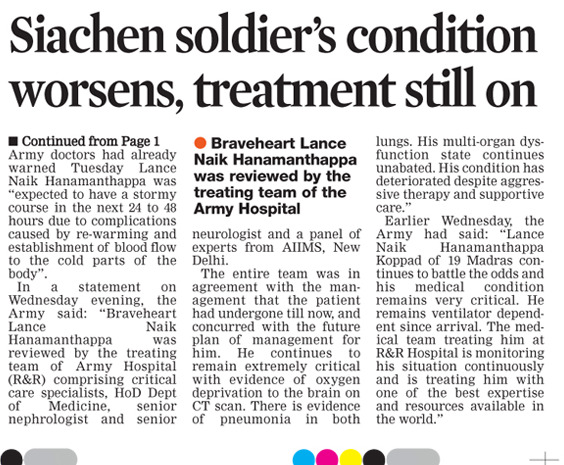 “The rescued jawan has multi-organ dysfunction and that continues…His condition has deteriorated despite aggressive therapy and supportive care,” it added. Hanumanthappa remained ventilator-dependent since his arrival in the hospital yesterday, it said. The medical team at the R&R Hospital was monitoring his condition regularly and he was being treated with the best expertise and resources available in the world, the Army said. Hailing Hanumanthappa’s “endurance and will power”, Congress president Sonia Gandhi wished for his speedy recovery. Capt Shikhar Deep of 8 Sikh Light Infantry went missing under mysterious circumstances after he boarded a train in Bihar on the intervening night of February 6 and 7. He was travelling to Delhi from Katihar on the Mahananda Express. Sources said Capt Shikhar Deep was a resident of Bihar. He was posted with Sikh Light Infantry (Sikh Li), a unit based in Nowshera sector of Jammu and Kashmir. His father, Lt Col Anant Kumar, told the Army that his son spoke to him while onboard the train on February 6 at 10.40 am. Shikhar (25) told his family that two persons who did not have confirmed tickets were in his compartment. The Captain's relatives arrived at the Delhi railway station to pick him but he did not reach there. However, his belongings, including his shoes, clothes and an empty wallet, were found in the train. The location of his phone was traced to a hotel at Bihar Sharief on February 7 morning. Since then, the phone is switched off. The Army authorities are trying to locate the missing officer with the help of the police. "The officer (Captain) might have been looted by the criminals by offering drinks or food mixed with drugs/intoxicant or sedatives," said a senior Army officer. "They (miscreants) mix drugs and sedatives with food, drink and even prasad. We have received reports about women being used to lure jawans," said another officer. The state Home Department has been awaiting a response to a proposal submitted by it to the Ministry of Defence a year ago for enhancing compensation package to people affected by field firing ranges across the state. 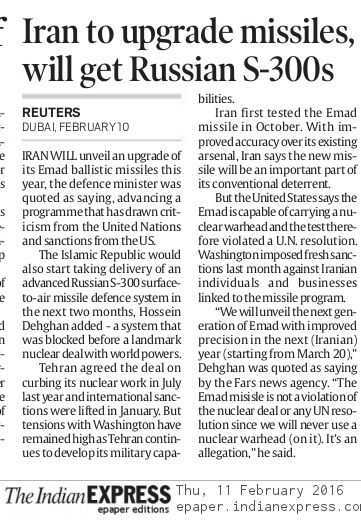 On February 27 last year, the Home Department had submitted the proposal to the Ministry of Defence and, on February 7 this year, Governor NN Vohra had requested Defence Minister Manohar Parrikar for enhanced compensation. Jammu Divisional Commissioner Pawan Kotwal said the rates of compensation being given to the affected population were fixed almost three decades ago. “We have sent a proposal to the Centre suggesting enhanced rates relevant with the existing market rates. The affected people are getting paltry compensation,” he added. He said that on the days of firing, the Army, well in advance, asks the people living close to ranges to stay indoors to remain safe and sometimes they have to be dislocated, which affects their livelihood. 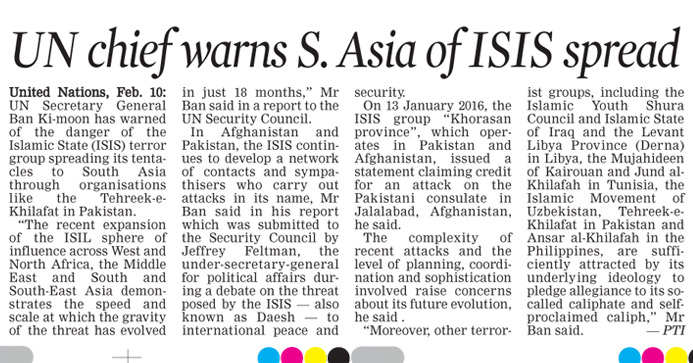 State Home Secretary RK Goyal said the Centre’s response to the proposal was still awaited. 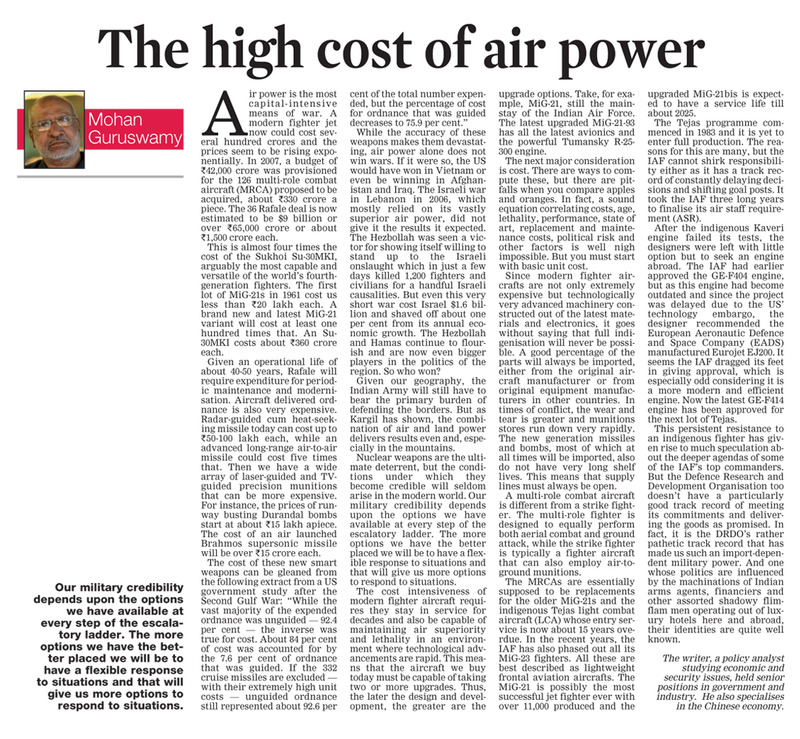 The Defence Ministry has been asked to give compensation at a par with the market rates. On restrictions on movement and dislocation of local populace on days of firing, the Army has fixed Rs 8 (for the day) and Rs 12 (for the night) for males and females above 18 years. The Home Department has suggested hiking it to Rs 151 (for the day) and Rs 225 (for the night). The Home Department proposed Rs 2.50 lakh for deaths due to firing, Rs 2 lakh for 100 per cent disability, Rs 1.50 lakh for 50 per cent to 100 percent disability and Rs 1 lakh for disability below 50 per cent. 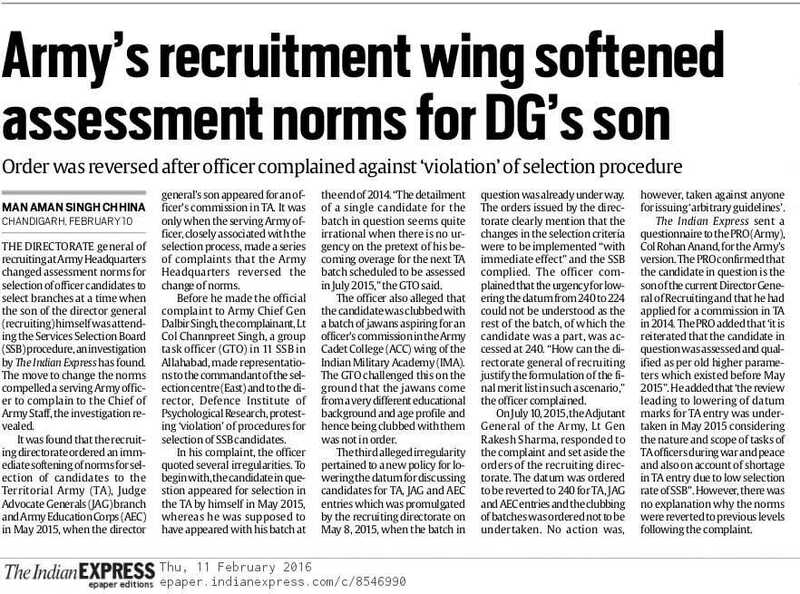 The letter mentioned that to date the Army has not paid compensation or ex gratia for losses or injuries to human lives due to the firing practice. A compensation for livestock of the villagers killed due to firing practice has also been proposed. The letter also suggested compensation for crop loss, a joint survey of which should be conducted by the Revenue authorities with the Army unit concerned. The letter also contained objections of the people to renewal of firing ranges. The objections were based on displacement and restrictions imposed on movement of people on days of firing that affected their economic activities; deaths due to shells remaining unexploded and not cleared by the Army units after firing; damages to building and other structures due to tremors as a result of explosions; issues related to medical treatment of the injured and compensation for livestock and crop loss. The “Agenda for Alliance” of the PDP-BJP government had also wanted that monetary remuneration should be made by the Army at market rates. SEOUL: North Korea's army chief of staff has been executed, South Korean media reported on Wednesday, in what would amount to the latest in a series of purges and executions of top officials by leader Kim Jong-Un. 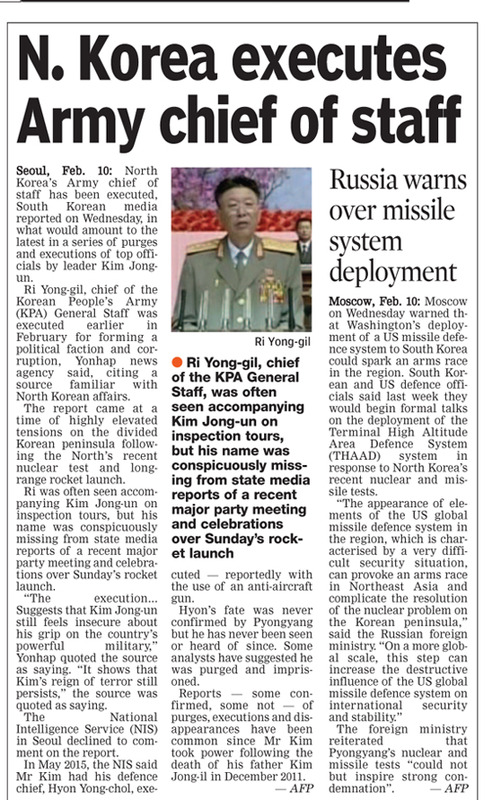 Ri Yong-Gil, Chief of the Korean People's Army (KPA) General Staff was executed earlier this month for forming a political faction and corruption, Yonhap news agency said, citing a source familiar with North Korean affairs. The report came at a time of highly elevated tensions on the divided Korean peninsula following the North's recent nuclear test and long-range rocket launch. Ri was often seen accompanying Kim Jong-Un on inspection tours, but his name was conspicuously missing from state media reports of a recent major party meeting and celebrations over Sunday's rocket launch. "The execution... suggests that Kim Jong-Un still feels insecure about his grip on the country's powerful military," Yonhap quoted the source as saying. "It shows that Kim's reign of terror still persists," the source was quoted as saying. The National Intelligence Service (NIS) in Seoul declined to comment on the report. In May last year the NIS said Kim had his defence chief, Hyon Yong-Chol, executed -- reportedly with the use of an anti-aircraft gun. A large number of senior officials, especially military cadres, were removed or demoted as the young leader sought to solidify his control over the powerful army. In the most high-profile case, Kim had his influential uncle, Jang Song-Thaek, executed in December 2013 for charges including treason and corruption.